Your organization will be enabled with competitive advantages from cloud services and solution such as higher efficiency, greater flexibility, lower costs and better performance for your applications and services. Because cloud computing represents a shift from the traditional way of thinking about IT resources, making the transition to the cloud requires careful planning and strategy. What should move to Cloud – Infrastructure (IaaS), Platform (PaaS), or just Applications (SaaS)? What are the potential future applications for developing in Cloud versus integrating with Cloud from on-premise? How prepared is the IT department to handle this change? Many questions need to be considered prior to embarking on a Cloud strategy. As a premier Microsoft Cloud Solution Provider and a Microsoft Gold Partner, Infochola has the credentials to help you put together an Azure Strategy for your entire organization. You need to reduce operational cost while increasing the effectiveness of IT processes. You can able to deploy your apps and services more quickly in the Cloud. Azure will take care of Security issues like unwanted traffic from outside and ensure security updates are applied automatically to prevent from vulnerable in your application. Azure has a backup solution to take a backup of your resources automatically and Monitoring in Cloud. Azure gives a flexible cloud migration path across your on-premises and cloud environment. 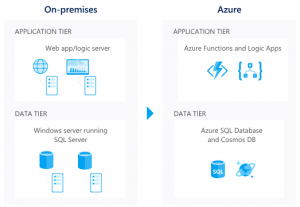 SQL Database managed instance enables you to lift and shift SQL Server databases to Azure without code changes, providing database-level compatibility with the adeptness of a fully managed database service. Azure offers unique value during every stage of your cloud migration. Use free assessment migration and cost management tools as your migration process. Azure offers hybrid support to eliminate the risk connect in the mind by moving all your infrastructure in a single action. You will have to access a partner ecosystem with advanced cloud migration products and services and to customer success service such as Fast lane for Azure. This assessment tool is very helpful to customers more easily to find and better understand their current server setups, to help them determine the cost and value of moving to the cloud, the post stated. Once the servers are discovered, the tool can analyze their configurations, and give the user a report of the potential cost drop of moving to Azure. Data Center administrator can able to export the report of the assessment into a customized. Free to get a pre-migration performance baseline to compare to post-migration performance for timely identification and resolution of problem areas. 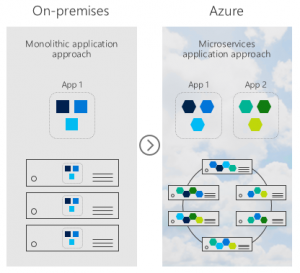 Azure has a four-different kind of way to host your on-premises infrastructure to cloud. Move your applications from your data center to the cloud quickly. Your applications are architected to leverage Azure IaaS scalability. 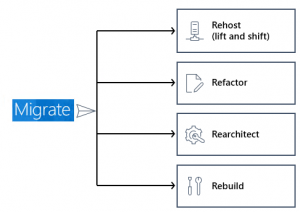 Refactoring often referred to as “repackaging,” is a cloud migration approach that lets you minimally alter application code or apply configuration changes necessary to connect the application to Azure PaaS and take better advantage of the cloud. You need to use an existing code base and development skills and code portability is a concern. Your application can be easily repackaged to work in Azure. You want to apply innovative DevOps practices provided by Azure. Your IT team is investing in DevOps using a container strategy for certain workloads. Modify or extend an existing application’s code base to optimize the application architecture for the cloud scale. For example, Decompose a monolithic application into microservices that work together and readily scale. And rearchitect your relational and non-relational databases to Azure fully-managed DBaaS solutions, like Azure SQL Database Managed Instance, Azure Database for MySQL, Azure Database for PostgreSQL and Azure Cosmos DB. Your application needs a major revision to incorporate new capabilities or to work more effectively on a cloud platform. You want to make use of existing application investments. You want to meet scalability requirements in a cost-effective way. You want to minimize the use of virtual machines. 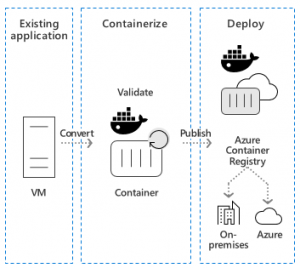 Rebuild an application from scratch using cloud-native technologies from Azure. For example, build greenfield applications with cloud-native technologies like serverless, Azure AI, Azure SQL Database Managed Instance, Azure Cosmos DB and others. You want rapid development and the existing application is limiting in terms of functionality and lifespan. You are ready to build new applications using cloud-native technologies. You want to build innovative apps taking advantage of advancements in AI, the blockchain, and IoT. You want to expedite your business innovation. Azure has an inbuilt application to protect your cloud using Security and Management resources to govern, secure and Monitor. 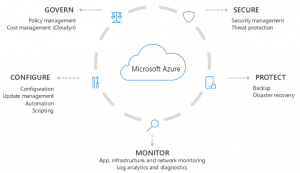 You can begin using these services during your migration and with Azure hybrid support, continue using many of them for a consistent experience across your hybrid cloud. In general, these resources help you run a secure and well-managed environment while using products available in the Azure portal. Azure allows you to track cloud usage and expenditures for your Azure resources and other cloud providers including AWS, Google. Easy to understand the dashboard reports help with cost allocation and chargebacks as well. Cost Management helps optimize your cloud spending by identifying underutilized resources that you can then manage and adjust. 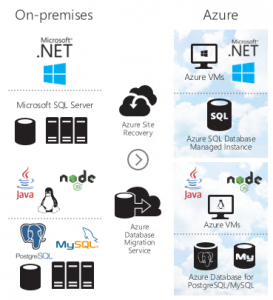 Azure Backup is reliable, secure and cost-competitive services in Cloud. You can use to take a backup and restore your data in the Microsoft cloud. It’s replaced your on-premises or off-site backup solution with a cloud-based solution.